I’m guessing that you already know about getting vitamin C from oranges. Do you also know that kiwi, red pepper and broccoli are good sources of vitamin C? How about strawberries, cabbage and brussels sprouts? There are many fruits and vegetables which provide vitamin C, which is a good thing since it is an essential dietary nutrient (we are not able to make it, and must have a regular source of vitamin C in our diet). 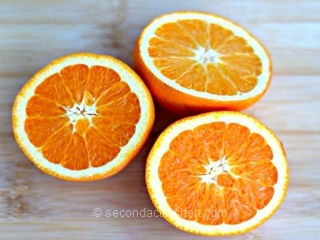 Vitamin C helps us make collagen which is important for connective tissue and is needed for wound healing. It’s also involved in the production of certain neurotransmitters, which provide signalling from nerve cells to other cells. Vitamin C also helps with protein metabolism, serves as an antioxidant and can help prevent scurvy. You remember scurvy…it’s the condition that sailors used to get on long ocean journeys back in days of yore. If you want to learn more about Vitamin C, take a look at Vitamin C: Quick Facts from the Office of Dietary Supplements, which is part of the National Institutes of Health. Vitamin C is one of the water-soluble vitamins, and the recommended daily amounts are 90 mg per day for adult men and 75 mg per day for adult women. Too much vitamin C can cause diarrhea, nausea and stomach cramps. According to the USDA National Nutrient Database, one cup of raw red cabbage provides about 40 mg of vitamin C, one cup of raw broccoli provides 78 mg of vitamin C, and an orange provides around 70 mg of vitamin C. So, if you eat enough fruits and vegetables as part of your daily diet, it should not be difficult to meet your daily need for vitamin C. Also, don’t forget — adding a little vitamin C to your spinach helps with absorption of nonheme iron.